Google released Picasa for Mac. While we’ve previously offered both a standalone Picasa Web Albums uploader and an iPhoto plugin for Mac users, Picasa for Mac finally brings all of the advanced sharing and sync features of Picasa to the millions of Mac OS X users who use Picasa Web Albums. Not to mention the “it-slices-and-dices” feature list that covers everything from color balance to collages. 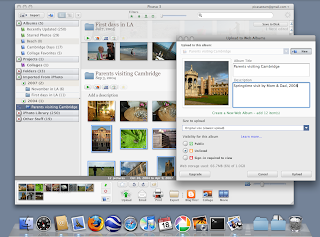 Picasa for Mac looks and works much like Picasa on other platforms, and offers trademark Picasa features — such as non-destructive editing, and the ability to keep track of photos anywhere on your hard drive, then automatically account for new images as you add them.